I split off a piece to then split off smaller pieces down to about 1 1/2 inch square. From there I went to the shave horse and sized to fit through a 1 1/8" hole in the seat of the shave horse. I want to end with a peg to drive into a 1" hole in a 8" square beam. After making several pegs and realizing how much work is involved, I decided to try something else to speed up the process. Starting with the rived piece from the main block as before, I used a jointer to get two sides flat and 90 degrees to each other. Off to the band saw to resaw 1" square pieces and then using a router with a 1" round over bit to end up with a peg that I can trim off the square ends and taper the peg to fit through the 1 1/8" hole. Because I won't be using these pegs for several months, should I air dry the pegs at this point and then size to fit a 1" hole just before needed? Is the 1 1/8" green size ok for now? I have some peg blanks that have both heartwood and cambia layer, can these be used for timber frame assembly or should I use only heartwood? When I am ready to drive pegs into the frame, what lubricant should I use, if any? Thanks for your comments and help with this part of the process. I am new to timber framing and want to learn how to do it right. 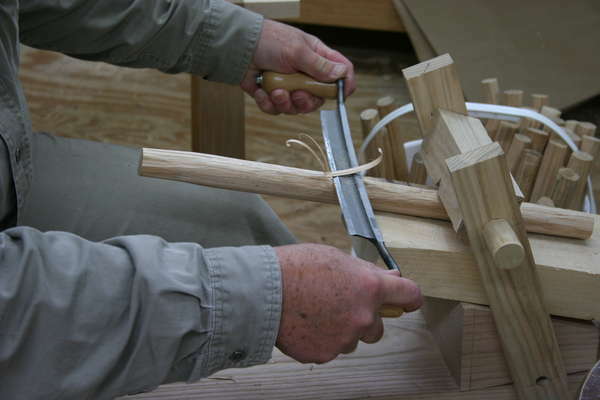 Recently, the latest issue of "Timber Framing" #107 had an article about making pegs. You may want to purchase this issue if you want to read it. You should be able to do so through the TFG (timber framer guild) online store. I wouldn't use anything but heartwood. The taper doesn't need to be much only the last few inches, what will be outside the timber after it is driven home. That way the full width of the peg is inside the entire timber. No lube should be needed. Your concept is sound, is it better than just hand made, that is (has been) debatable. I don't think it makes much difference as long as the stock is riven. We use a table saw. Jim's advice is good, try and get that article it is very educational. One thing I noted, is you had your draw knife upside down for the work you were doing on the body of the peg. I know many folks that use it that way, (rough style) and if it works for you, so be it, don't change. I know more folks that use them "rough" than "smooth style." Held they way you had it is for "rough" or fast cut of the tapper at the end. It cuts much more aggressively with the bevel up and "smooth" with the bevel down, which is the majority of the time how it should be used, at least from the position of ease of use (traditional), and fatigue. We rough them out of the bolt sections, (no cambium-sap wood) and dry them from there. Then prior to used, we shape them on a table saw down to an octagon shape, if we are using round pegs. They seat well without further rounding, but that is a taste/style and routered round is just fine. We soak ours in oil/beeswax the night before placement in the frame. Some will store there blanks in oil after drying and there very well maybe something to be said for that extra care. I noted less issue with the pegs treated with such care. The Amish I worked with kept them in large wood barrels, then prior to insertion, slathered them in "grease" as they called it. Smell like lanolin and beeswax. "To posses an open mind, is to hold a key to many doors, and the ability to created doors where there were none before." "When it is all said and done, they will have said they did it themselves. "-teams response under a good leader. Thanks for the reply and the info regarding the article in "Timber Framing". I ordered a subscription today. Thanks for the information and explaining different techniques you have used and observed. i'll experiment with the pegs I made and see what "works" with the timbers I make and assemble. Could you tell this was the first time I used a drawknife? I tried smoothing some pegs with the other side and it is easier to use that way. I don't have to finesse the blade as much as when I used it "upside down"
I sorted out the pegs I had with sap wood. I didn't think they would be as strong. Must be a good reason other than strength that negates the use of sapwood for pegs. Essentially no difference in mechanical properties between heartwood and sapwood. Possibly less decay resistance? less resistance to powder post beetles? ?? 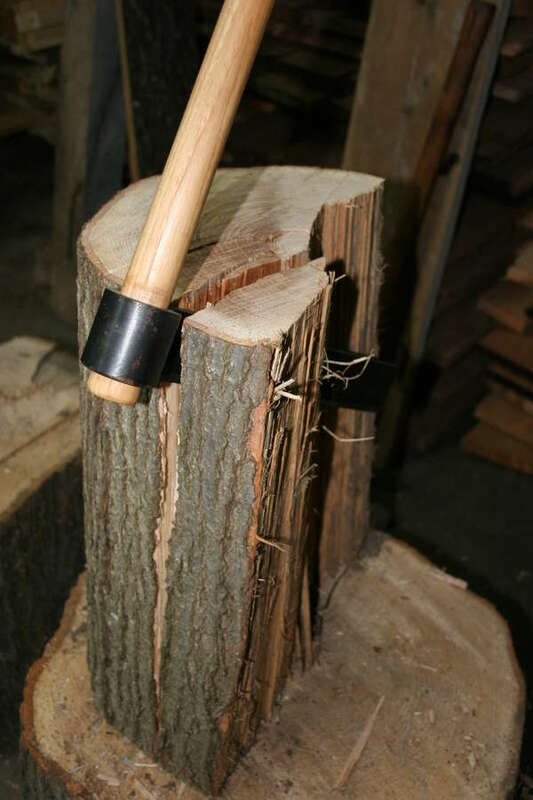 Jay, whether to use a drawknife bevel up or bevel downs depends as much on the cant of the handles and the shape of the back as it does on whether you are going for a fine cut or a coarse one. I have two drawknives - one is designed to be used bevel down and one bevel up. I prefer the bevel-up drawknife, because I have much more control with it for fine work. The back is not quite flat, but rounded just the slightest bit so the blade doesn't dive in as you're using it. When I use the bevel-down drawknife, I do just as you suggest and turn it bevel up for hogging off big pieces, then flip it bevel down for more finesse. But usually I use a spokeshave to do the final finessing anyway, so I don't use it bevel down a whole lot. The drawknife that Stan is using does appear to be a "bevel-down" drawknife, but it could easily be converted to a bevel-up drawknife by rounding the back a bid and bending the handles downward a tad. I find that a shaving horse and draw-knife works very well. I cut 1" x 1" Red Oak blanks on the saw mill and then throw them in a tub of water for a day or two. For cutting them, just take a touch of each corner (octagon shape) and shave the end for draw pinning. It only take a minute or two per peg. Don't worry about making them round just test fit the octagon shaped peg (I have a 1" hole drilled in the shaving horse for this job). The edges will bite when you install the pegs. Nice work ! I like octagon too. I thought the same thing when I was younger, but got correct more than once by the Amish I worked with, then watching "Wheel Wrights," "Coopers" and "Bodgers," I started to key into the subtitles of "draw-knife" work. I agree that the handle does determine the "cut" off the draw-knife, but they are still suppose to be used bevel down for fine work, and bevel up for rough. The one Cooper laughed when I asked him about it, saying he had always "done it the wrong way, now there is no hope for him." Which speaks to the fact that muscle memory and training can go a long way with hand tools. I can use most draw-knives just like a spoke shave, but I agree for those that don't or haven't used them extensively, spoke shaves are the way to go. They are great for peg making too. You looked fine, it's not a big issue about draw knives, more of an FYI then see what works best for you. As for sap wood to heart, same strength generally once dry, but there is a differential between the two. It also has the starches that react differently to environmental elements from temperature, compression in pounding them in, and of course, the buggies. One way to think of it is like in bow making, they have different properties, Sapwood works better in tension and heartwood better in compression. Hey guys I have cleared the lot for my house and have a bunch of wild cherry. would that be suitable for making pegs from. Other than that I have maple and birch readily available. Anything else I may have to buy. Also should the pegs be roughly an 1/8 inch larger than the holes? I am just thinking an 1/8th inch larger peg and an 1/8th inch offset of the holes seems problematic. Of those those 3 species, I would go with (in order) Birch, Maple, Cherry. It really depends on grain straightness. If the Cherry yields the straightest grain, then that is what I would go with. Also, note this is a general guide line, not a hard fast rule. If your peg creation process works for you and yields nice strait grain pegs, then all is good. My thought is that your blanks are way to big, and your spending too much time on the shave horse. For example, we often use 13/16 pegs. So we lay out a 1.5" grid on the top of the stock, and split those out. Those 1.5 x 1.5" chunks are quartered by eye, giving roughly 3/4 x 3/4. Remember the peg diameter is on the diagonal of that 3/4. The piece is straightened and cleaned up quickly to a square, then the corners are knocked off with the drawknife. Taper the tip, check it, and it's done. I believe what Jay meant is that for 1" pegs, the 1 7/8" square blanks are quartered, and then shaved. I think, that's what I do. Jay, I was wondering about the 1 7/8" blank too. I've made my blanks a bit larger than the desired peg size so far. It would think that quartering a 1 7/8" square would be too tight for 4 pegs? I haven't had much direct experience of other people's methods and have just been winging it, so I would love some clarification. Thanks. Thank's Brad and Sean, for saving me from poor editing... I'll go back and fix it. at the recent timber framing conference they did some examples of pulling joints apart to test there strength and which part of the joint failed first. it was the expectation of the PHD engineer that the relish would break free before the peg or the mortise would fail, but in all but one or two tests it was the peg that failed first. 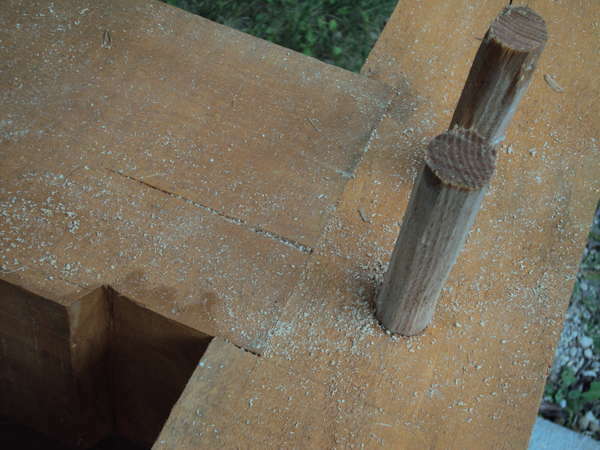 the peg bent in the middle forming a V shape and would then allow the tenon to slide out of the mortise, it created a great deal of friction while trying to slide out of the mortise and many of the joints maintained full strength until the test was stopped, short of actually removing the tenon from the mortise. 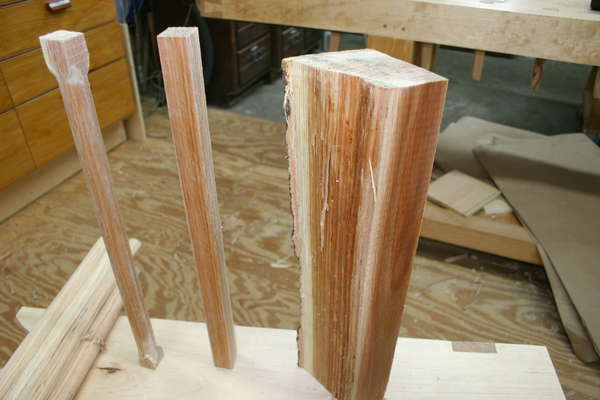 so with that, even though most of the joints surpassed there expected physical limits, it seems that we should pay more attention to the pegs, the pegs they were using were red oak turned on a lathe and all seemed to have pretty straight grain. and i should mention all the tests were of joints in tension, in a well made frame design, joints in tension are minimized while joints in compression are used as often as possible, since they are generally stronger. You made my night. Seems like you been doing you reading, watching and studying, good for you. You made some great observations. Thank's again for sharing that. That's pretty accurate to what he said jueston. The original poster didn't mention whether the log chunk he was splitting out was dry or green? Make a huge difference. A very green chunk makes for easy and smooth draw knifing. Draw your grid pattern on the face of the log chunk, split it out into blanks, then throw them in a tub of water- one of those rubbermaid tubs works. This way they can't dry out before you go to draw knife them. Keep an eye on your tub water. Make sure no mold forms. Put a few drops of bleach in there if need be. Draw knifing tapered pegs goes about a peg a minute if it's nice 'n wet. Then they only need to dry out for a few days before you use them, longer is fine. Thank you Jay, I was getting confused with the blanks that makes a lot more sense to me now. I will go ahead and use the birch probably then. Brad_bb just for information, the wood was green. Brad you are right, I was starting with a blank that was too large and trying to shave it down to a round 1". It was fun to experiment but not very productive. I've since split off smaller blanks, squared them to 1" and sliced off the corners to an octagon shape. Much faster and better looking pegs. Thanks Jay, Jander and everyone else for the help. Hope this weather warms up soon, I'm past ready to get to work on the sawmil shed. Timber size calculator and timber frame design.